Hierapolis, a UNESCO World Heritage site, was an active metropolitan center from its foundation in the 2nd century BC, through Roman rule and well into the Byzantine era. 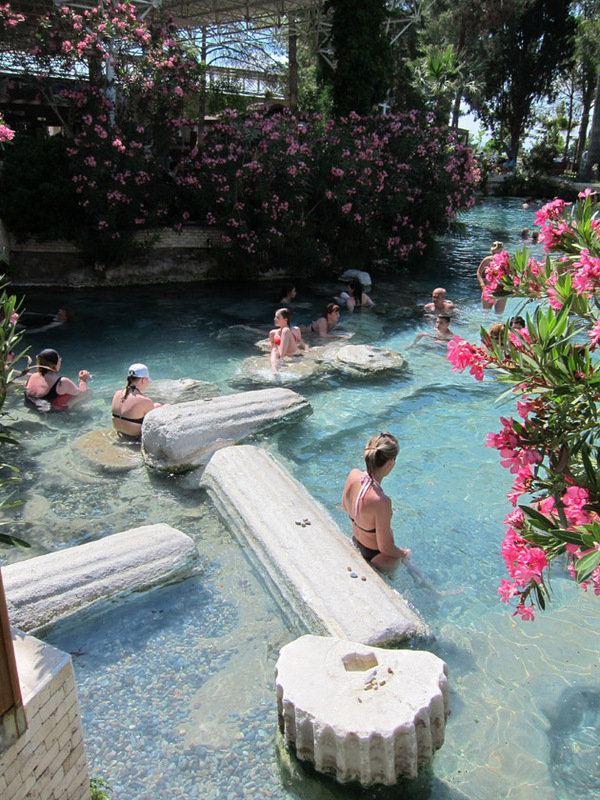 In addition to several bath complexes in the city, there was a natural thermal spring connected with the Temple of Apollo which attracted visitors seeking divine cures. 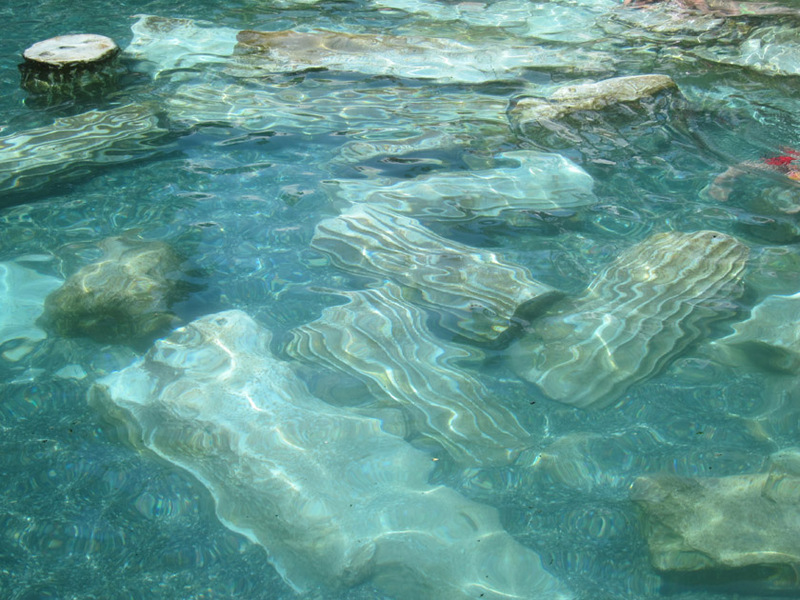 Subsequent earthquakes shifted the spring so that today the pool is filled with toppled columns from the Roman temple’s portico. As if the water wasn’t pleasant enough, it’s fun to climb over and sit on the two thousand year old ruins! The heavenly water is warm and clear blue. The mineral content makes the water thick and soft, while the dissolved carbon dioxide forms little bubbles all over one’s skin. It is these same minerals that produced the White Cliffs of Pamukkale over centuries of slow crystal growth. I went swimming after climbing through the dusty and rather dispersed ruins of the city of Hierapolis. The soothing water was a wonderful treat! Natural spring water entering the pool. 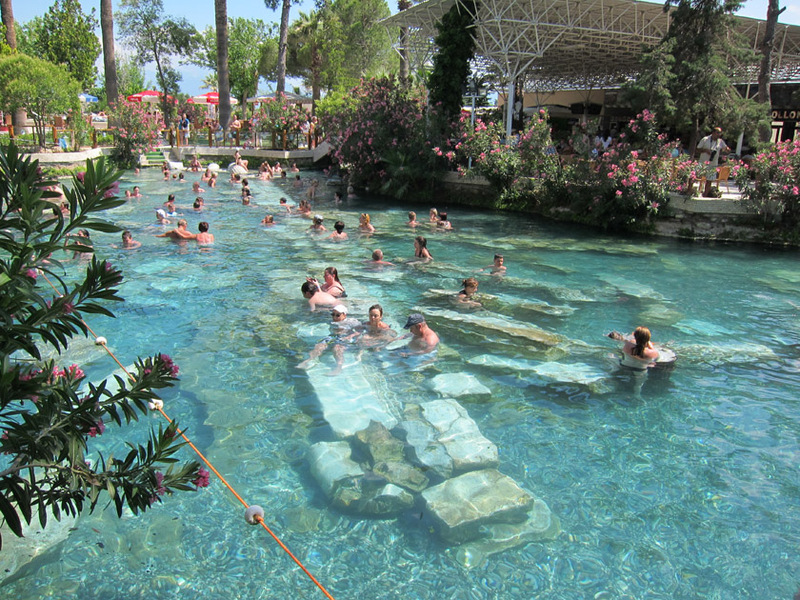 For around 40TL, you can swim in the thermal spring and use the modern lockers, showers and changing rooms. Since the pool is huge, you’ll be able to find space for yourself, even after a few bus loads of Russian tourists arrive. (True story.) There is also a nice bar for a beer and snack after your relaxing soak – which is likely also what the Romans would have done after a bath too. 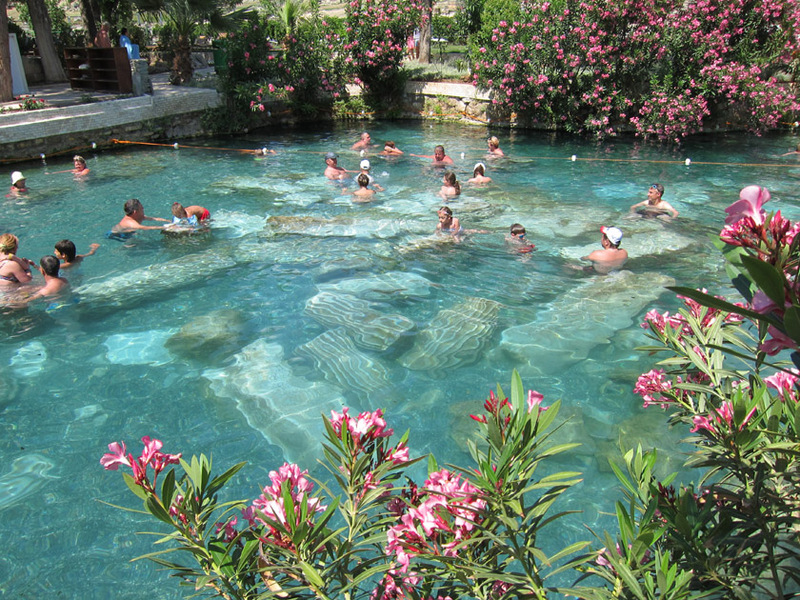 Hierapolis is located in Pamukkale which is about a 3hr drive east from Kusadasi on the Western Turkish coast. Within the archaeological site, the pool is more or less in the center of the city portion and closer to the Southern tourist entrance.